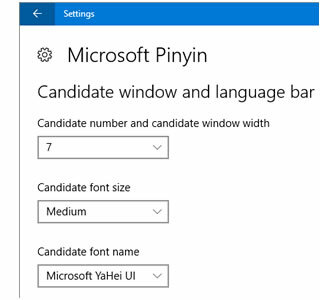 How do I get the "candidate list" to appear in the PRC/Singapore Chinese (Simplified, China) Microsoft Pinyin IME, how do I use it, and how do I adjust it? In Windows 7 and earlier, the candidate list can also be set to appear automatically, as shown here. We will discuss how to change this setting later in this article. The Windows 10 first-year "Anniversary Update" (version 1607) added emoji to MSPY. 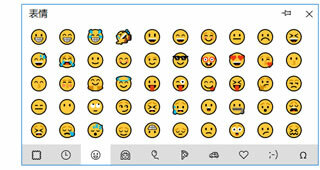 Click on the smiley face at the far right end of the candidate list or press <Ctrl Shift B> to bring up the list. is a new set of Traditional characters. See the missing/broken/lame features page. • Options. Takes you to Settings > "Language & region". Customize MSPY in Windows 10 and 8 by going to Start > Settings > Time & language > Language & region > mainland/Singapore region Options > Microsoft Pinyin Options. In Windows 10 the desktop language bar "Options" (gear) button takes you halfway there. In Windows 8 some of these options are in a similar spot, while others are in the "classic" control panel described in the next section for older systems. But your choices in Win 8 are a bit more limited, and sometimes you have to make the same change in both the new and old panels separately. 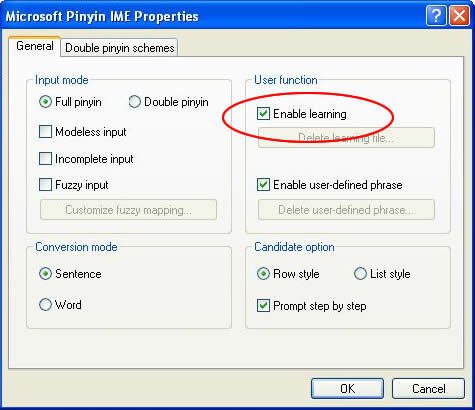 In the Options panel you can choose full or "double Pinyin"; choose your default language and 中/英 hotkey (or "None"); select domain lexicons (technical and business terms, mostly) and built-in special phrases; turn on automatic sorting of your candidate list and other system training; adjust the candidate list length, size, and font; "cloud input" phrase lookup on Microsoft servers as you type; fuzzy input, and more. For more on MSPY in Windows 10 and 8, see the Win 10 missing/broken features FAQ and the Win 10 Help files page, or the Win 8 missing/broken features FAQ. 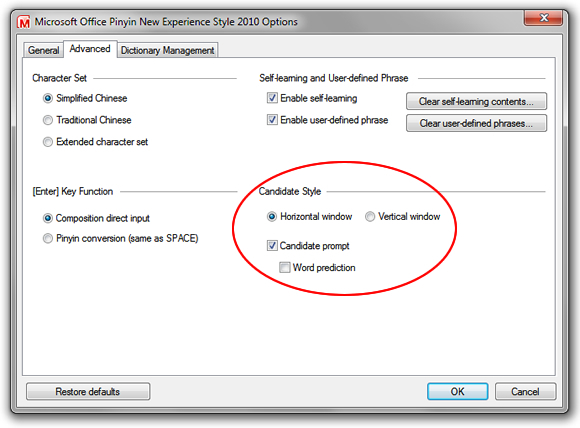 Customize Windows 7 and earlier to set the candidate list to display by default and make other changes. To see the candidate list, press <left arrow> to move back over the character, and the list will appear. You can then can scroll through the list with <down arrow> and <up arrow> to move through the choices one-by-one, and <Page Up> and <Page Down> or the "[" and "]" bracket keys to move through pages. Select any character or phrase with <space bar>, type the number, or click on it. or click on it with a mouse. While you are on the sentence line, when you press <space bar> twice or <Enter> once, you have accepted the suggested character(s) there. 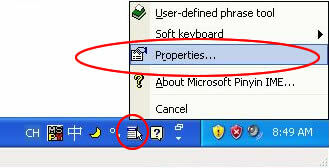 In Windows 7 and Windows Vista, on the Language bar click the Options menu and in the menu click "Options". In the dialog box that appears, make sure the Input Style is "MSPY New Experience", and click the checkbox next to "Candidate Prompt - MSPY New Experience". You can also select preferences like "Horizontal window" or "Vertical window", and "Word prediction". In Windows 8, to get at the Help files and the rest of these settings in the first releases, turn on the old-style Language bar (on the desktop Taskbar). 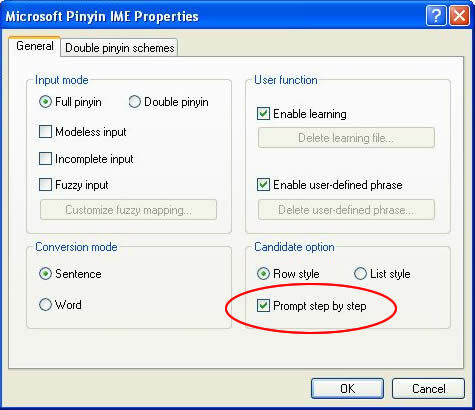 You'll find instructions for this towards the end of my page on Windows 8 Traditional Chinese Pinyin input (search for "Advanced Settings"). Then follow the instructions for Windows 7/Vista. For Windows XP, see the Windows 7/Vista Help page and you'll get the general idea. Sorry, I never got around to doing a separate page on that.